Major golf championships started before the Civil War: Willie Park won the first British Open, a 36-hole affair at Prestwick, in 1860. The U.S. Open debuted in 1895, and it was followed by the PGA Championship (1916) and the Masters (1934). To identify the greatest major championship players of all time, SI Golf Group devised a point system, and in the end, Jack Nicklaus—the record holder with 18 professional majors—emerged as the greatest major champion. The magazine started with the 1892 British because that was the first year the event was contested over 72 holes. While players from more than a century ago competed in only two majors a year, keep in mind that fields were considerably smaller, meaning it was easier to accumulate top 10s. So the playing field is somewhat leveled when comparing one era with another. Surprised? Big Jack played in the most majors and had the most wins (18), most seconds (19) and most top 10s (73). Had seven wins and 60 top 25s; his biggest disappointment was that he never won the U.S. Open. Nine wins and 18 top threes, and his 70 top 25s are second only to Nicklaus’s 95. His eight wins are sixth-all time, but he never won the PGA, losing in a playoff in 1978. Has a remarkable 20 percent win rate, but his victory drought is at six years and counting. First player to win the modern Grand Slam, and the first to win the U.S. Open and the PGA in the same year (1922). His seven wins came in a six-year window, and he was a 10-time runner-up over his career. 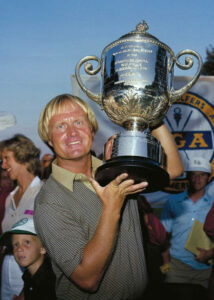 Turned his only top-five in the U.S. Open into a victory in 1986 and was two back of Jack at the 1978 British. Fabulous record for a late bloomer who coped with the Depression, World War II, and a serious car accident. Didn’t win his first major until age 34, and he holds a dubious record in the U.S. Open. Most wins of anyone before World War II, and his 20.7 percent win rate is the best of all time. Has won majors in three decades, and he was in contention on Sunday in six of Tiger’s 14 victories. What could have been—he was in the hunt, if not in the lead, in a dozen majors on the back nine on Sunday. Six-time winner, made most of his opportunities after being in contention just 12 times. In contention more than a dozen times, but had problems closing the door on the back nine. Accumulated a lot of points due to longevity as well as his 16 top-fives. Only flaw for this six-time champion was his indifferent play at Augusta National. Contended in all four and was at his best in the Masters (five top-5s) and the British (nine top-10s). Excellent record despite playing during the Great Depression and World War II, retired in his prime at age 34. Won in three decades and only played the British five times, never before age 38.